New Year’s Eve on the slopes! Even if you haven’t even celebrated Christmas yet, it’s not too soon to plan New Years’ Eve. Once you have a family, New Year’s takes on new meaning. Forget tuxedos and fancy dinner dance dates. Getting a babysitter on this big night is as big a stretch as finding an affordable limo. Gunstock rocks New Years, catchy slogan for this New Hampshire ski area. They call it “Magic Mountain Eve” and the all-inclusive price of $40 for adults and teens, $30 for children and seniors (5 and under free), gets you skiing till 11:30, sleigh rides, Tubing, snowshoeing, live music, a DJ and entertainment, plus childcare at the Buckaroos for your littlest one (must reserve in advance). Food and beverage is extra, and available at the Powder Keg Lounge and the Main Hall of the grand old base lodge. What a cool way to spend the last night of the year, skiing and tubing under the lights, rockin’ to music at Gunstock. Cranmore in North Conway New Hampshire will hold a special edition of their popular all-inclusive Cranapalooza event on Dec. 31, called “Crantastic New Year.” $59 for children, $69 for 13 and up, includes skiing and riding plus rental equipment from 2-9pm, Arctic Blast snow tubing, face painting with C-more the Penguin, a DJ dance party in the Fun Zone, dinner plus live music, a bonfire, and fireworks at 7:30 for the younger set and again at midnight. 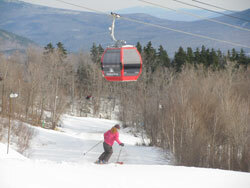 Sunday River, and the bustling little town of Bethel, has a fun filled New Year’s Eve planned. Take your family into town on the free Mountain Explorer shuttle for the annual New Year’s Bethel for a parade, and bonfire with marshmallow roasting at the Town Common. Then back at the mountain, there’s night skiing on Sunday River’s Chondola, followed by a fireworks show to light up the night sky. Wachusett has an all-inclusive night of skiing till midnight, fireworks, live music and a magician, karaoke and guitar hero for the kids, plus a balloon drop when the clock strikes 12. Winter Park Colorado has an amazing Torchlight Parade and fireworks for families. Vail also has a big celebration on New Year in Vail village. Or, stay in, watch a video of Time Square – pre-recorded from the lat year’s NYE ball drop , pop the cork with the kids (sparkling cider) at 9pm, so you can get up and ski the open slopes first tracks on New Year’s Day – when last night’s revelers are sleeping off their raucous ringing in of the New Year. Here’s to no lift lines in the New Year!